Under the lights of Bahrain, we were treated to a fine spectacle as plenty of dicing in the midfield more than compensated for a rather sedate affair up front. 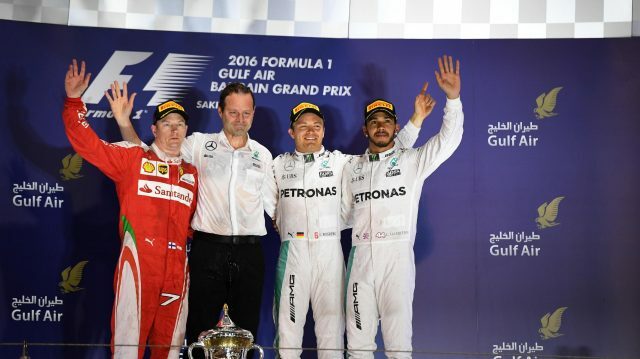 But how did the drivers fare in the third night race at Sakhir? 44) Lewis Hamilton (6/10) – Lost the initiative to teammate Rosberg at the start. Was not at fault for the first lap collision with Bottas but would have been out of harms way with a quicker getaway. Decent recovery to third. 6) Nico Rosberg (8/10) – Flawless drive to a fifth straight win. Beat Hamilton off the line and never looked back as his rivals hit trouble to record a convincing win. 5) Sebastian Vettel (6/10) – A day of wretched misfortune for Vettel, who didn’t even make it to the start after the German’s engine blew on the formation lap, robbing him of the chance to challenge for victory. 7) Kimi Raikkonen (7/10) – A strong drive for Raikkonen who bounced back strongly from his non-finish in Australia to record a deserved second place. Consistent speed meant he was never under huge threat from Hamilton. 77) Valtteri Bottas (5/10) – The Finn ruined his race with a lunge at Hamilton that earned him a drive-through penalty. Battled back to ninth place, but could and should have been so much better. 19) Felipe Massa (6/10) – That the other Williams of Massa finished eighth was through little fault of the Brazilian, who was hamstrung by a poor decision from his team to run two stints on the medium tyres. 3) Daniel Ricciardo (7/10) – An entertaining race from the Australian as he found himself involved in good battles throughout the race. The speed of the front three meant fourth was the best he could have hoped for. 26) Daniil Kvyat (7/10) – The Russian recovered well from a dismal qualifying performance to take seventh from Massa on the final lap, with some exciting battles as he recovered through the field. Quickly needs to improve his speed on Saturdays. 11) Sergio Perez (5/10) – A day to forget for Perez, who made contact with Carlos Sainz Jr’s Toro Rosso on lap two and was forced to pit for a new front wing. Wound up a disappointing 16th. 27) Nico Hulkenberg (5/10) – Hulkenberg’s race proved as inauspicious as Perez’s, with the German also forced to change his nose after first lap contact, condemning him to 15th place. 20) Kevin Magnussen (6/10) – A respectable job from the Dane, who finished just one place outside the points after a pit lane start. A good effort in a Renault that was clearly lacking in speed. 30) Jolyon Palmer (5/10) – After an action-packed debut in Melbourne, it was back down to earth with a bump for Palmer, who pulled in and retired from the race at the end of the formation lap with technical troubles. 33) Max Verstappen (7/10) – After flattering to deceive in Australia, Verstappen bounced back in Sakhir with a strong drive to sixth, Toro Rosso’s first ever points finish in Bahrain. 55) Carlos Sainz Jr (5/10) – A thoroughly forgettable time under the lights for the Spanish driver, who suffered a puncture in a collision with Perez early on and endured a botched pit stop before he retired from the race. 12) Felipe Nasr (5/10) – Sauber have clearly dropped back in performance over the winter and it looks like the Brazilian has suffered the same fate. An almost anonymous drive to 14th place. 9) Marcus Ericsson (6/10) – The Swedish driver looks to have gained the upper hand on teammate Nasr, with 12th place the best he could have achieved in what is clearly a dog of a car. 47) Stoffel Vandoorne (8/10)*** – Having only found out he would be making his Grand Prix debut on Thursday, the Belgian hotshot announced himself to Formula One in style with a mightily impressive drive to the final points finish in tenth, having outqualified world champion teammate Button the day before. 22) Jenson Button (5/10) – A weekend to cause nightmares for Button, with his outqualification by Vandoorne and early power unit failure sure to result in questions about his McLaren future beyond the end of this season. 93) Pascal Wehrlein (8/10)** – Another eye-catching performance from the German youngster, who outperformed his Manor all weekend with a fine drive to 13th after a superb qualifying display. 88) Rio Haryanto (6/10) – Although overshadowed by the mercurial Wehrlein, the Indonesian drove a solid, clean race on his way to a first Formula One finish. 8) Romain Grosjean (9/10)* – Driver of the Day. The Frenchman’s move to Haas looks even more inspired now after an astonishing drive which bettered his fairytale sixth place finish in Melbourne. 21) Esteban Gutierrez (6/10) – An encouraging performance by the second Haas driver, who would surely have scored his first points since 2013 had car failure not ended his race after just ten laps. These scores will be added up throughout the season and will be used to calculate both mid-season and end of season driver rankings. To take into account individual performances, the driver of the day will receive an additional three points, the second best driver two points and the third best driver one bonus point. These are signifed by the number of asterisks next to their names. ← Can Ferrari challenge Mercedes for the title this season?